As I walked into the market this past Thursday, a cart piled high with gorgeous sugar pie pumpkins greeted me, and I was inspired to take a shot at reinventing the dish with a Southwest/Mexican flair. This is a fine way to introduce pumpkin into a Thanksgiving meal in some form other than pie, and it’s a remarkably flexible recipe. In many ways, this “recipe” sort of resembles a road map, with a thousand thousand routes that will all lead you from your point of departure (the kitchen) to your destination (the table). You’ll want to note that all measures are approximate, because the pumpkin sizes will vary widely, but if you have leftover stuffing, you can always wrap it in tin foil (or, if you’re trying for a little more Southwest authenticity, a banana leaf or two), and cook it alongside the pumpkin. Arranging and wrapping the banana leaves in a way that will keep the liquid from seeping out may be something of a challenge, but it’s manageable. This version is gluten-free; it can easily be “veganized” by substituting your favourite vegan cheeses, and full-fat coconut milk for the cream (the reason I suggest the full-fat coconut milk as opposed to soy-, rice-, or almond milk is that the coconut milk better replicates the creamy mouthfeel). Center a rack in the oven and preheat it to 350°F/175°C. Line a baking sheet with aluminum foil, parchment, or a silicone baking mat so that if the pumpkin innards boil over (which they sometimes do, a bit), they don’t soil the inside of your oven. This pumpkin needs a cleaning out. Using a sharp and sturdy knife, carefully cut a cap out of the pumpkin’s top the way you would if making a Jack-o’-lantern. [Ms. Greenspan’s suggestion is to cut at a 45-degree angle. But be careful; the pumpkin rind is tough. I find that a stabbing motion, a la Psycho, is emotionally satisfying, but it’s your call.] 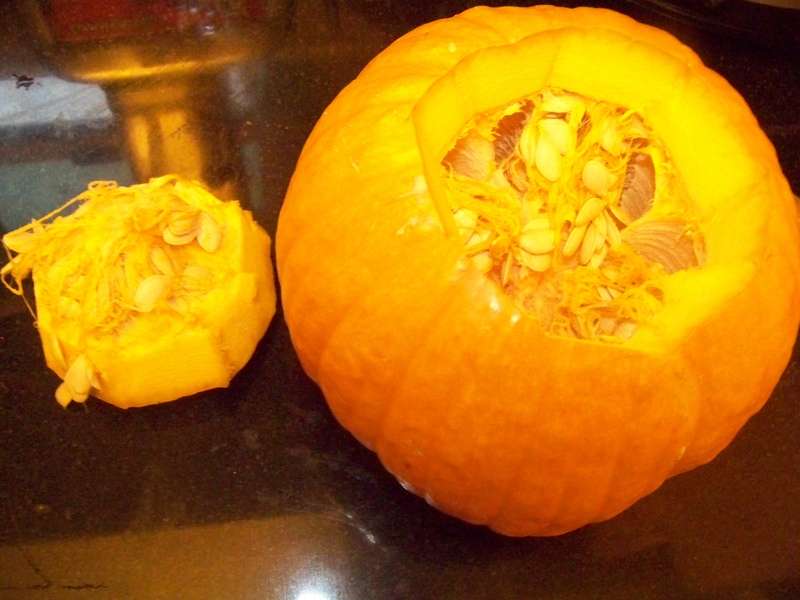 The opening should be large enough for you to work inside the pumpkin. Clean the strings and seeds from the cap, and set it aside (we’ll be using it later). Scoop out the loose guts (again, strings and seeds) from the pumpkin’s interior. 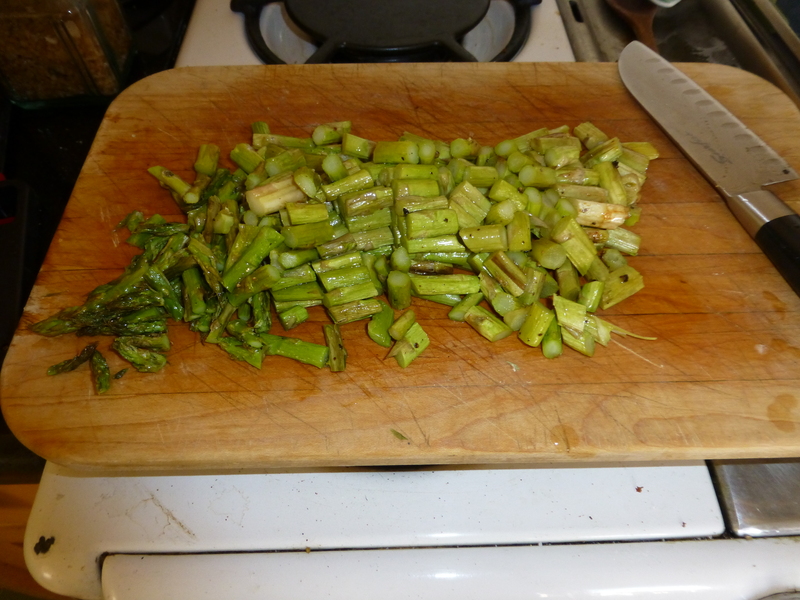 [The seeds can be cleaned, salted, and roasted later, should you desire, or you can toss them.] Season the inside of the pumpkin with salt and pepper, and place it on the baking sheet. Chorizo and onions and plantains, oh my! Heat a frying pan and cook the bacon until crispy, then let it drain on a paper towel. Peel the plantain and dice it into quarter-inch cubes. Remove the chorizo from its casing and put it, the chopped plantain, and the chopped onion into the still-warm frying pan (which should still have bacon grease in it, so no need for oil), being careful not to splatter hot grease. 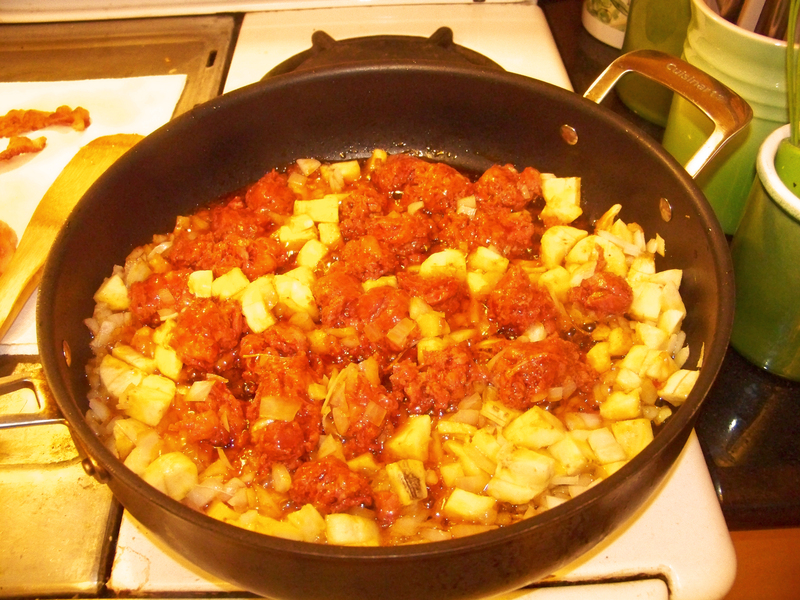 Cook for about 8-10 minutes, breaking up the lumps of chorizo, and stirring occasionally. Remove plantain, onion, and chorizo from pan with a slotted spoon (or drain in colander over a ceramic or Pyrex bowl, as you don’t want that grease going down your sink) and place in a large bowl. Add the bacon, bread, peppers, cheeses, scallions, garlic, cilantro, and oregano, then toss. Season with a bit of freshly-ground black pepper, and pack the pumpkin with the mix, leaving enough room for the cap to fit back on. [We’ll come back to what to do with any extra filling a little later.] Pour the cream into the pumpkin, and use your judgement to decide whether you need to use all of it; it’s for moistening the ingredients, not immersing them. Replace the cap and bake the pumpkin for about 2 hours — check it after 90 minutes — or until the pumpkin filling is bubbling and its flesh is tender enough to be pierced easily with the tip of a knife. You may want to remove the cap for the last 20-30 minutes of cooking to brown the top and evaporate some of the liquid. Note the colour change on the pumpkin. Gorgeous. You can moisten it with a little cream (not too much!) and wrap it in a banana leaf, seal it in tin foil, or even put it in a small covered casserole dish, and roast it alongside the pumpkin on the baking sheet. It can come out after 60-75 minutes (after all, it wasn’t insulated by all that pumpkin flesh), but even if you forget, it should still be plenty moist. 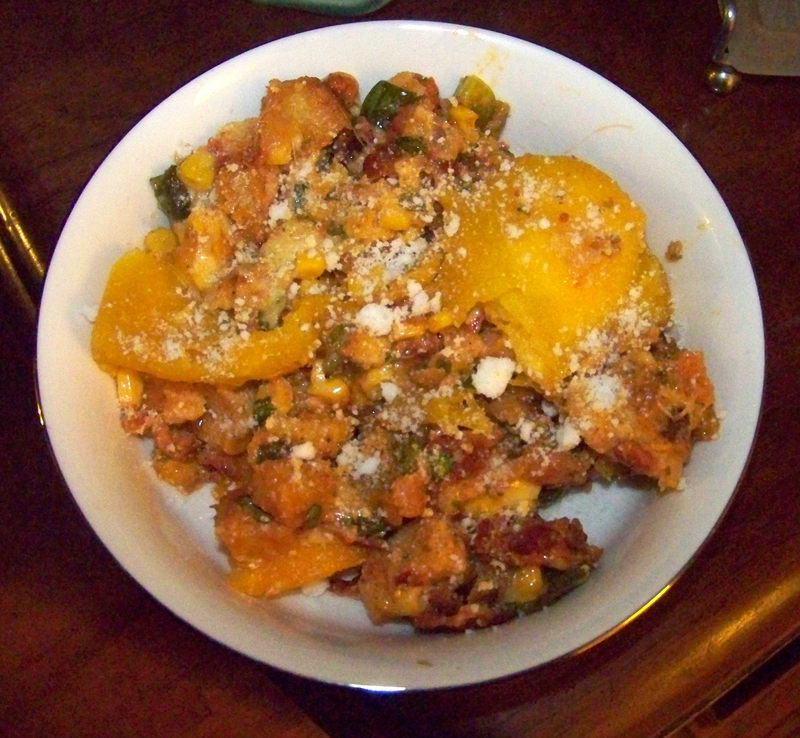 Alternatively (as this recipe yielded just about enough for TWO small pumpkins), you can freeze the remainder, making the next pumpkin-stuffing party all that much quicker. 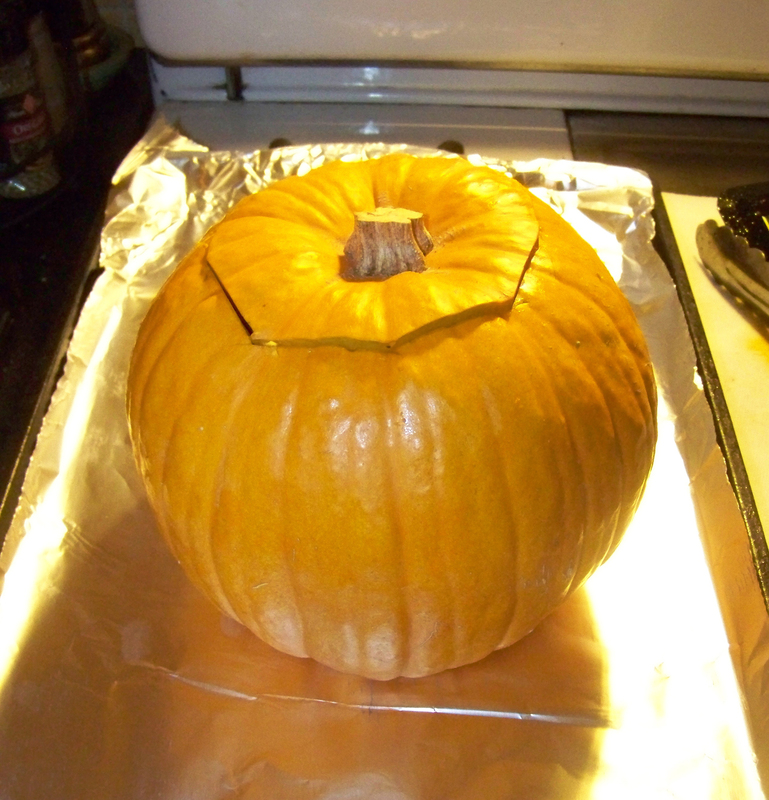 When the pumpkin is ready, allow it to rest on the baking sheet for about 5 minutes or so before trying to move it. Then, carefully transfer it to a platter and bring it to table. 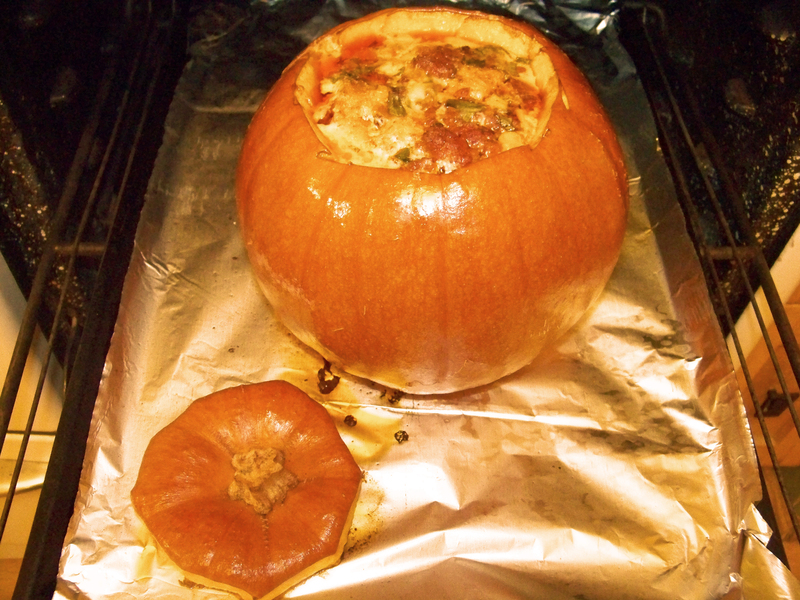 Remember, it’s hot, and the cooking will have reduced the pumpkin’s structural integrity, so take your time. It can either be cut into wedges with the filling spooned over, or you can scoop out pumpkin flesh and filling together. Garnish with the chopped cilantro leaves and/or Cotija cheese. Depending on the size of the pumpkin, the size of your guest list, and the size of your appetite, it can serve as either a main course, or the perfect accompaniment to a turkey or some other fowl. 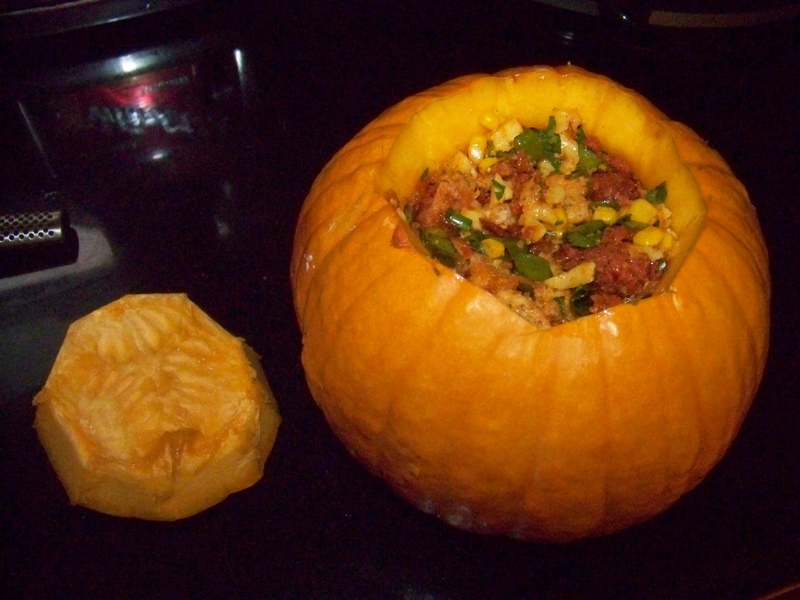 A little Cotija, and now the stuffed pumpkin is ready to return the favour and stuff you. Savory & Vibrant. It even says so. In 1920, drama critic William Archer took his own advice (from his 1912 non-fiction book Play-Making: A Manual of Craftsmanship) and wrote his first play, something of a pot-boiler called The Green Goddess. 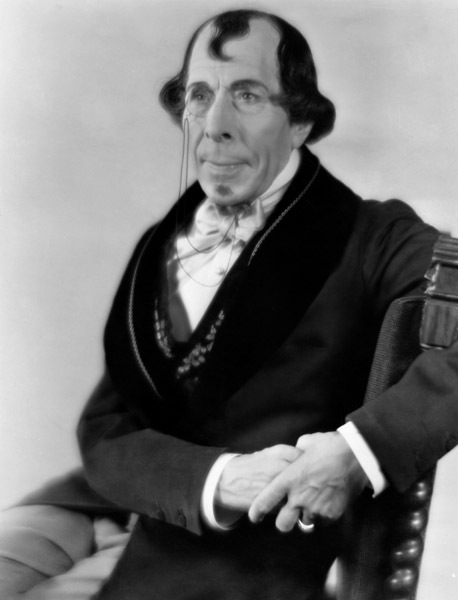 It opened, to some acclaim, on 27 Deceember 1920, at the Walnut Street Theatre in Philadelphia, and starred a gentleman named George Arliss. 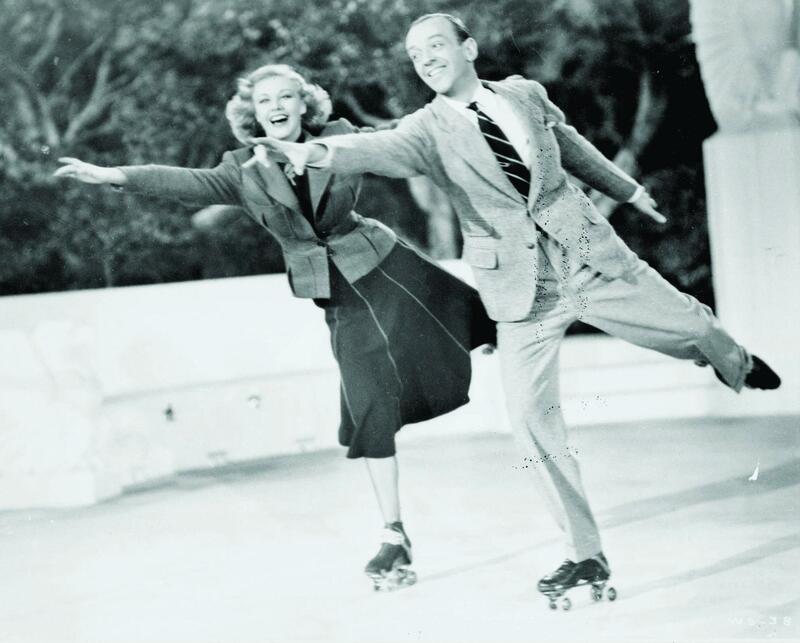 So popular was it that it opened on Broadway (at the Booth Theatre) less than a month later, and toured America for the better part of three years before opening a highly successful (and lengthy) engagement in London. 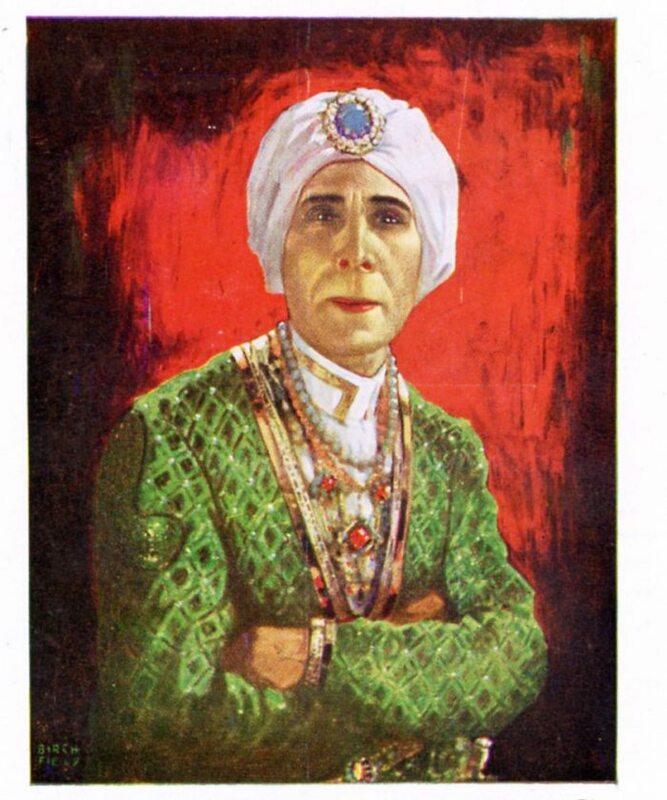 Along the way — and by the best triangulation available to me, sometime around March of 1923 — it played in San Francisco. 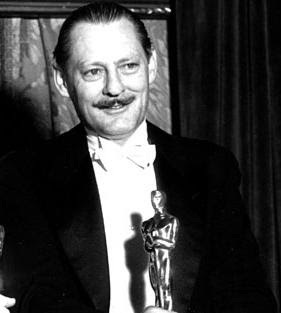 While in The City, Arliss stayed at the Palace Hotel (which is still around, incidentally), and dined at the hotel’s restaurant, which at the time was overseen by Executive Chef Philip Roemer. Depending on which story you want to believe, either the chef decided on his own to honour Arliss with a salad dressing inspired by the play, or Arliss himself put the chef up to it as a publicity stunt. Personally, I would like to think the former. Much like the salad dressing’s creation myth (even the hotel’s own website has gotten it wrong, predating the play’s creation by half a decade), the “official” recipes for Green Goddess dressing vary widely. And while I mean no disrespect to any of the bottled versions’ manufacturers, do have a go at making it yourself. 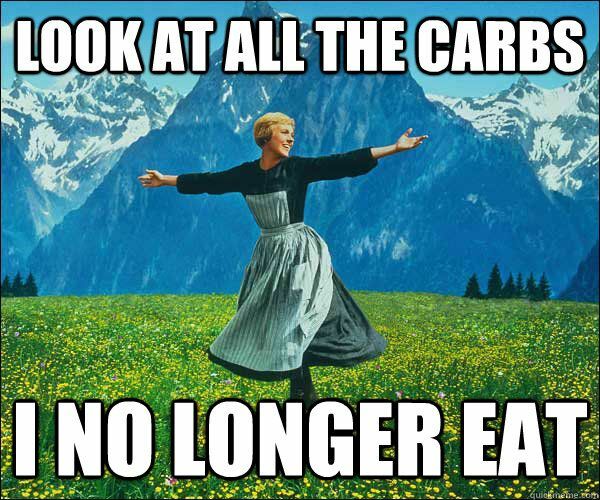 It’s dead simple, and it tastes so much better. As for the potato salad, which calls in the original recipe for green beans, I think asparagus (if available fresh) is better suited to it. Both provide a bit of toothiness, but roasted asparagus and roasted potatoes mesh like Ginger Rogers and Fred Astaire. 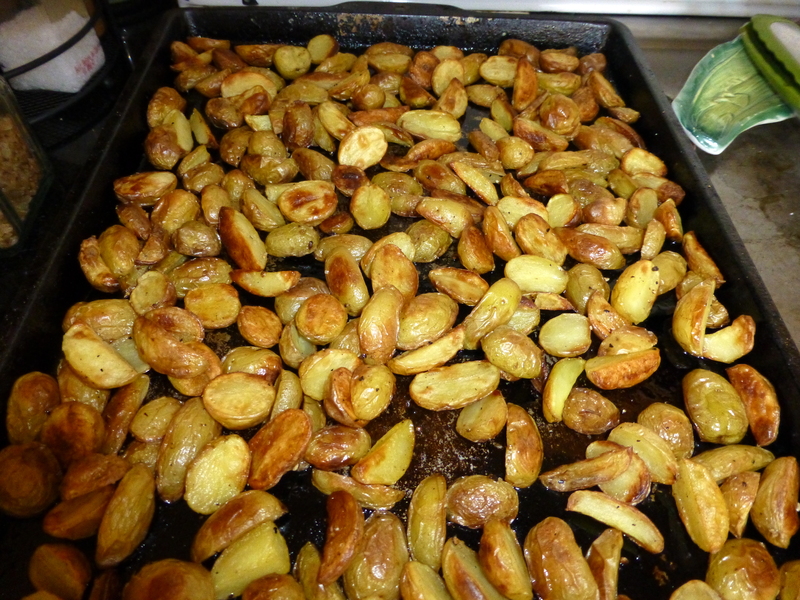 Preheat oven to 450°F/230°C Halve or quarter potatoes and place in plastic bag with olive oil; shake until coated and arrange in a single layer on a cookie sheet. Liberally sprinkle salt and pepper over. Roast for about 30-35 minutes, or until golden brown. (About 20 minutes in, turn over with spatula for even roasting.) Remove when done, allow to cool, and place in large mixing bowl. Chopped spears that have nothing to do with Britney. Preheat oven to 400°F/200°C Wash and trim and place in plastic bag with olive oil (you can use the bag from the potatoes if you wish, although you may need to add a little olive oil); shake until coated and arrange in a single layer on a cookie sheet. Liberally sprinkle salt and pepper over. Roast for about 15-20 minutes, or until slightly browned, but still with a little snap. Remove when done, allow to cool, chop into 1 inch/2.5 cm pieces, and place in large mixing bowl with potatoes. Mix with Green Goddess dressing and chill for 1-2 hours in refrigerator. Devour unreservedly. Pulse mayonnaise, sour cream, vinegar, scallions, anchovies, parsley, tarragon, salt, and pepper in a food processor until dressing is pale green and herbs are finely chopped. Refrigerate until use. Editor’s note: You don’t have to be either green or a goddess to make this salad spectacular. Although either would certainly enhance the presentation. 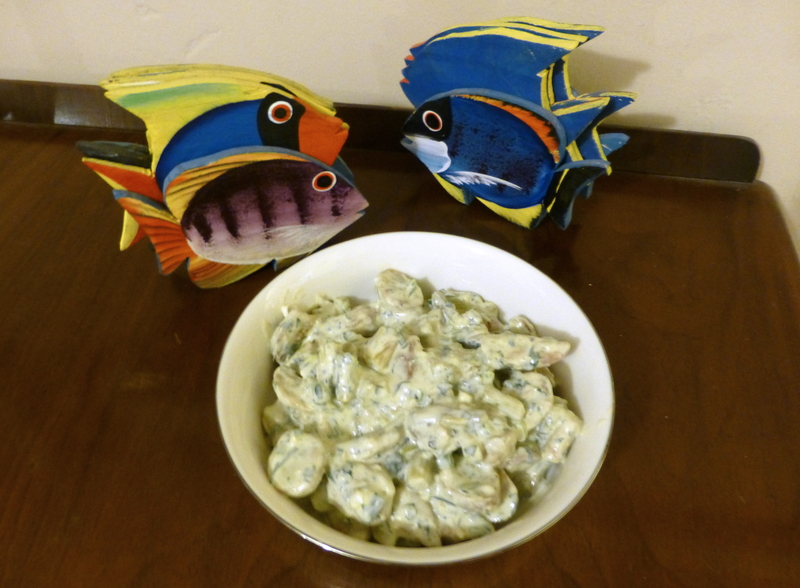 The finished salad, with wooden fish. Since American measurements are generally based on volume rather than weight, I’ve had to be a little loose with the metric conversions. For liquids, of course, they are pretty precise, but for dry ingredients, they’re a little more fungible (after all, a tablespoon of salt weighs a lot more than a tablespoon of dried parsley flakes). That said, the Interwebs have some conversion guides that have allowed me to get close, and fortunately, this recipe is pretty forgiving. I suppose in future that I would be wise to use my fabulous OXO Good Grips Stainless Steel Food Scale with Pull-Out Display to give an accurate measurement. But wisdom was never my long suit.